Biofilm Eradication and Preventions presents the basics of biofilm formation on medical devices, diseases related to this formation, and approaches pharmaceutical researchers need to take to limit this problem. Split into three parts, the first deals with the development and characterization of biofilm on the surfaces of implanted or inserted medical devices. Questions as to why biofilms form over medical device surfaces and what triggers biofilm formation are addressed. 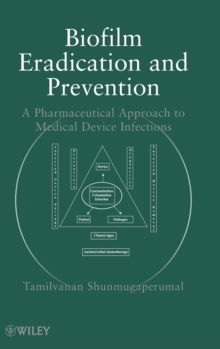 In the second section, the author discusses biofilm-mediated chronic infections occurred in various organs (eyes, mouth, wounds) and pharmaceutical and drug delivery knowledge gained from research in these area. The third part explores pharmaceutical approaches like lipid-and polymer-based drug delivery carriers for eradicating biofilm on device-related infections. In addition, this section also explores the topic of novel small molecule (like iron and its complexes/metal chelators) and a quorum-sensing inhibitors to control medical biofilm formation.